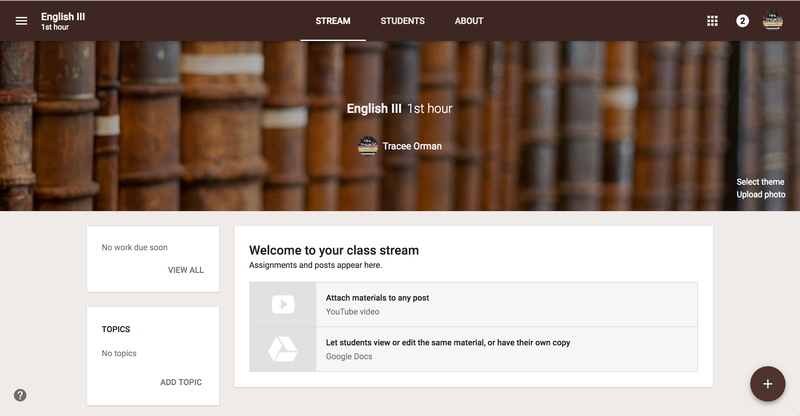 Now that you have decided HOW to set up your classes on Classroom™, it's time to start creating them. I will take you through the steps, explaining each one. You can also view the video screen recordings I've embedded to follow along. 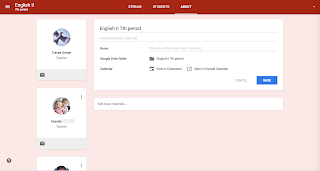 In order for your documents and students' work to be private and secure, your school should set up a G suite account. After you have opened Classroom™, you will arrive on the Home screen. 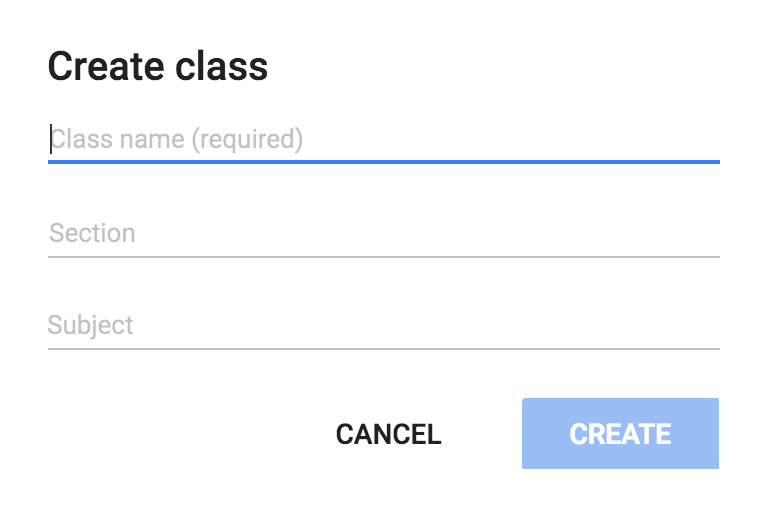 To add a class, click on the plus (+) sign in the top right of the screen. 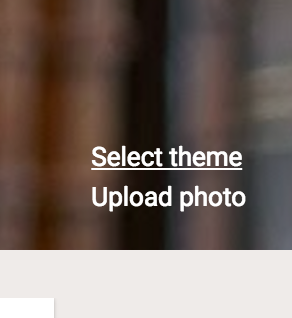 To change the look of the class, use the "Select theme" or "Upload photo" options on the right side of the screen. 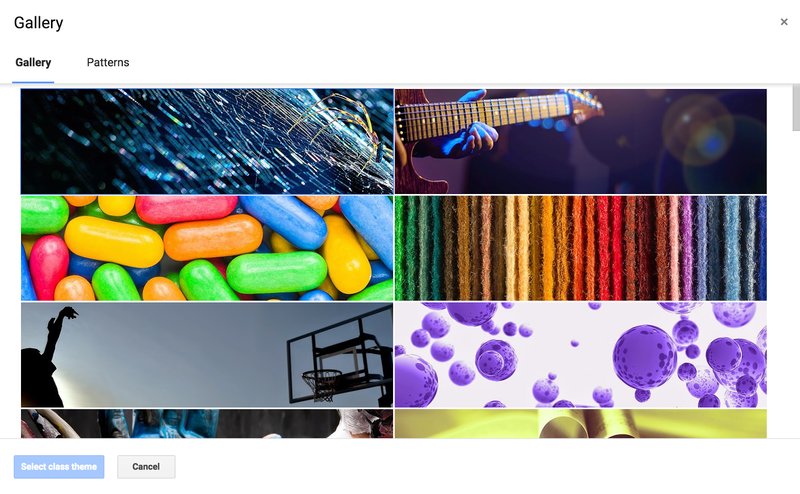 When you select the theme, you are given options in a "Gallery." 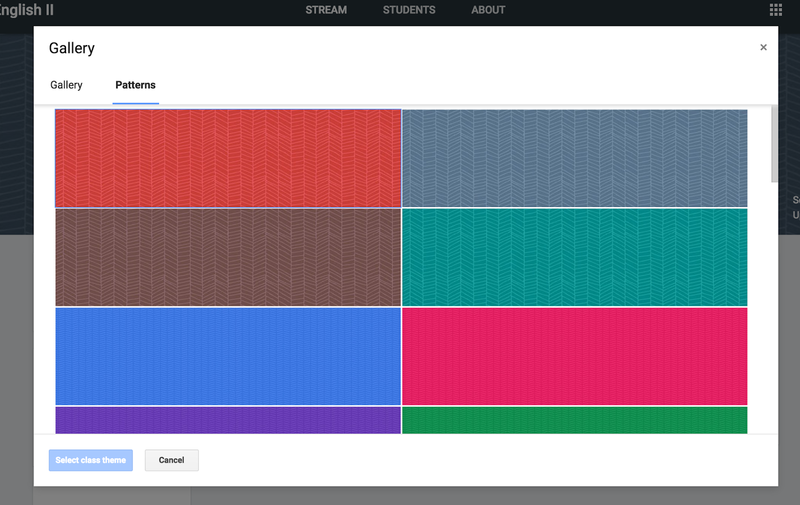 You can also select "Patterns" for additional selections. If you choose to upload a photo, make sure the dimensions are 2000 x 400 pixels (or 20.833 x 4.1667 inches). 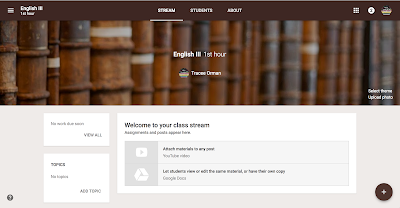 Your students will be able to access these materials anytime they need them without having to search the class stream. 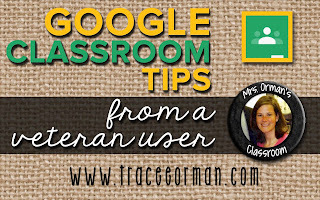 If you co-teach a class, have a teacher's aide, or want to give another teacher (i.e. 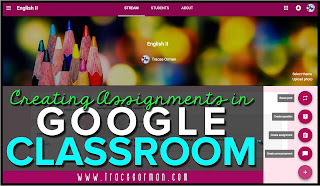 a special education teacher) access to your class, you can also do this in the "About" section. 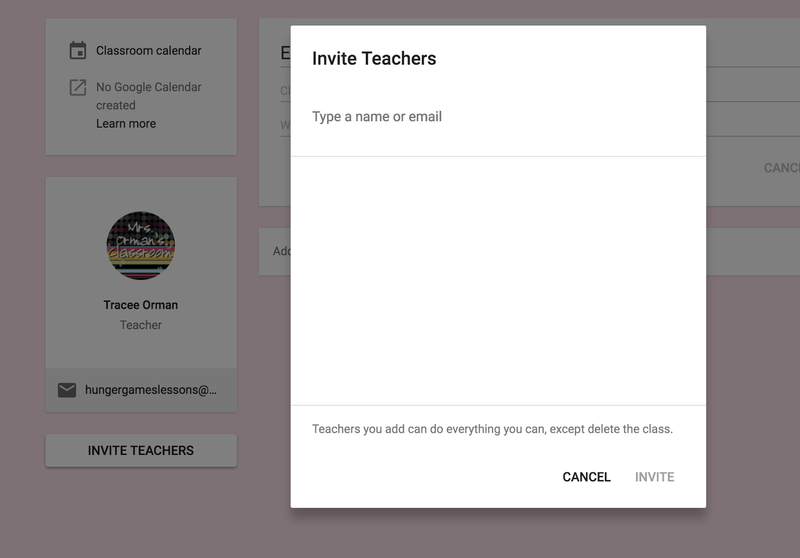 Just click on the "Invite Teacher" button and enter the email. 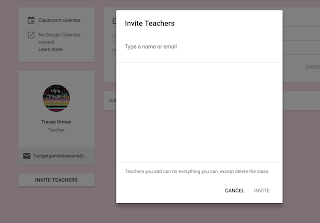 The teacher will be able to do everything you can do except delete the class. 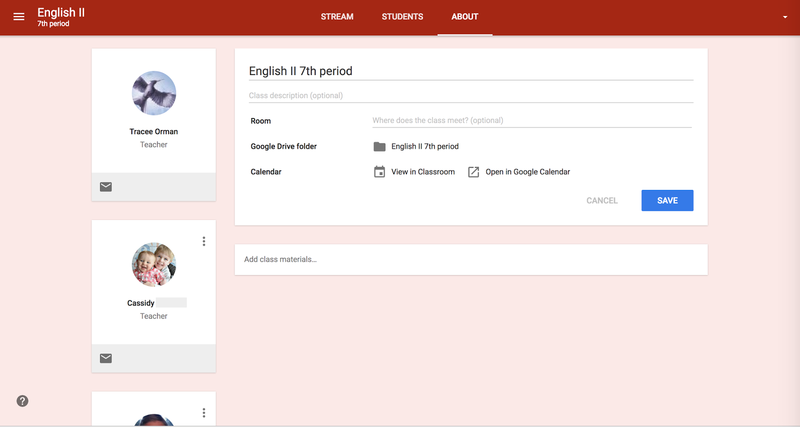 You can add details about the class in the "About" section. 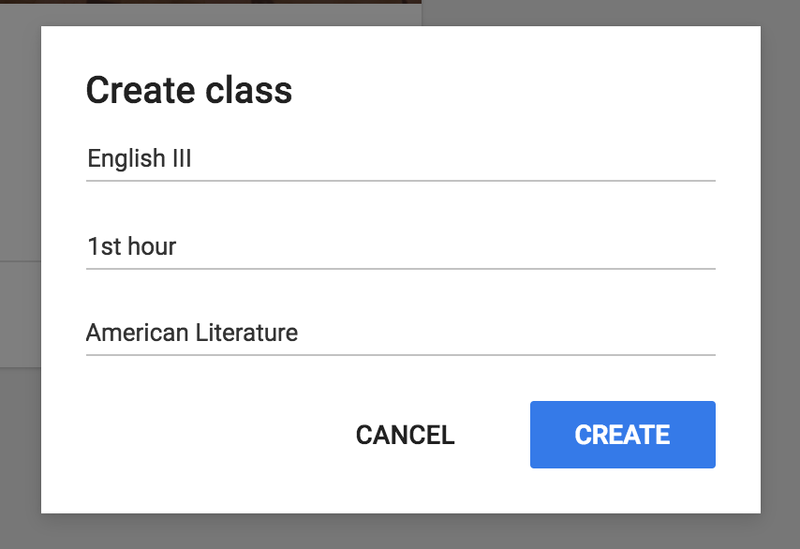 TIP: If you just want to give an aide or another teacher access to the assignments and class materials, it may be better to add them as a student. Most of my aides just wanted a copy of the online assignments so they could type in notes or answers for themselves. 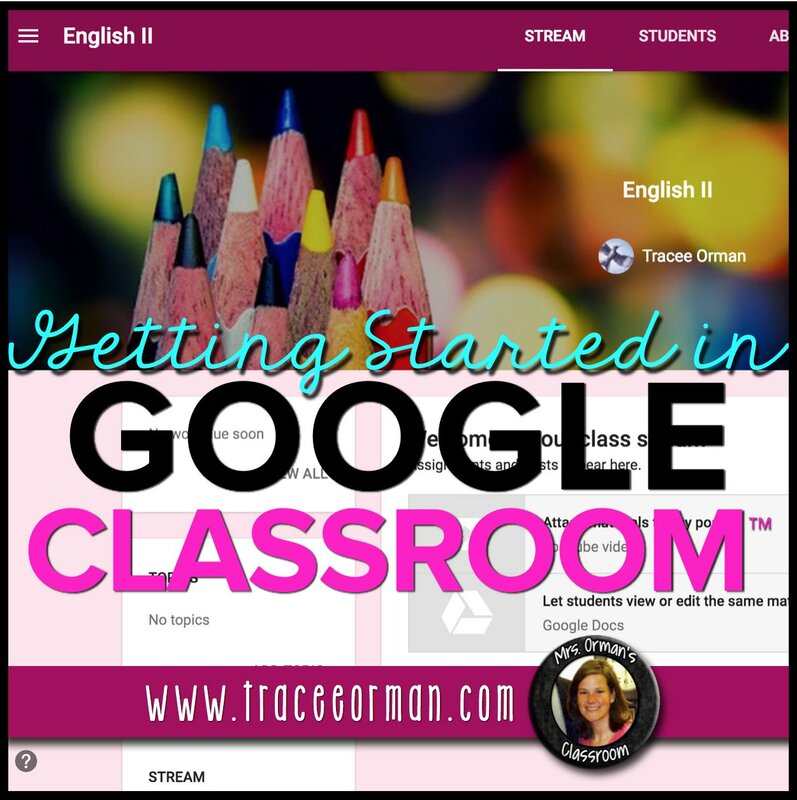 When they had access as a teacher, their notes would appear on every student copy because co-teachers do not get their own copy of the assignment like students do; they have access to YOUR original document. 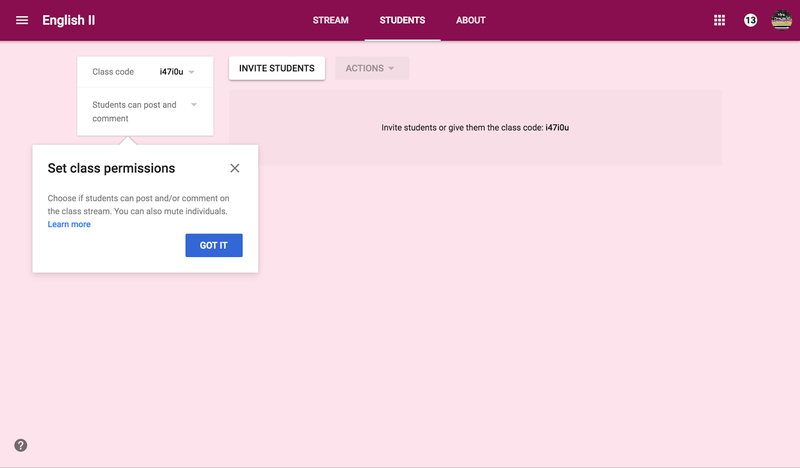 At the time of this blog post, Google Classroom™ does not allow you to set parameters for other teachers. If you still wish to give another teacher or aide full access, let them know ahead of time that if they plan to type on any documents you share, they MUST make a copy of the file first or it will mess up your template for the students. 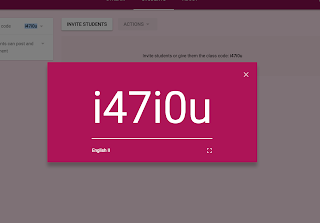 You can add students to your class manually by typing in their email addresses. But that can be very time-consuming. 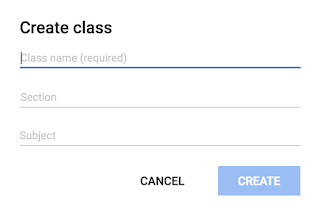 Every class has a unique class code. 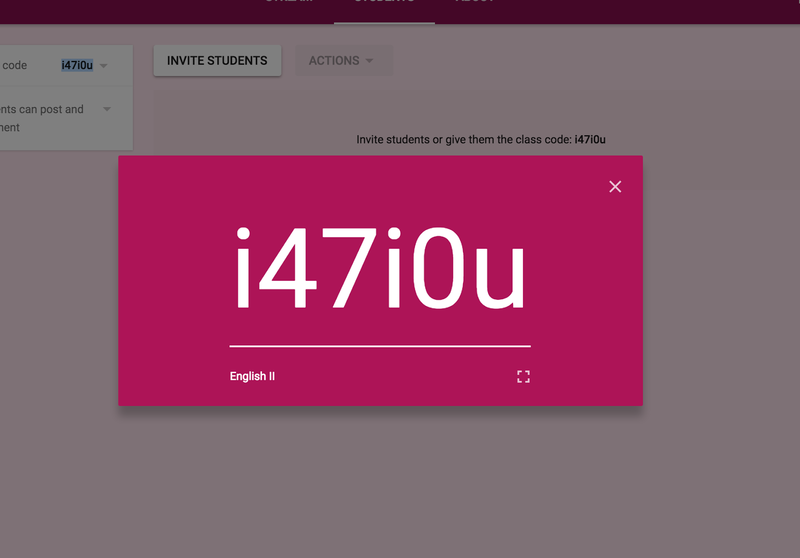 It's much easier to share your class code with your students and have them add themselves. 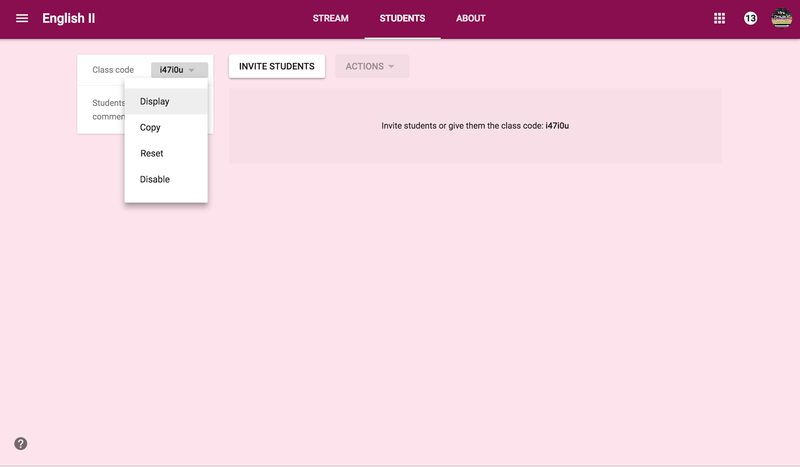 They will click on "Join class" on their home page, then enter the code you share with them. 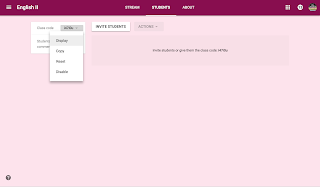 This is also where you can set parameters for your students. 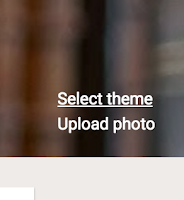 Do you want them to be able to create posts? Comment on posts? Or neither? 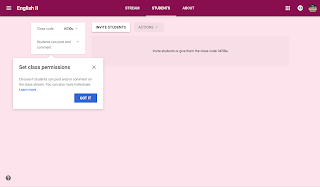 I have found that for some classes, I welcome the feedback and interaction of the students and for others, I had to disable all comment privileges because they made inappropriate remarks. 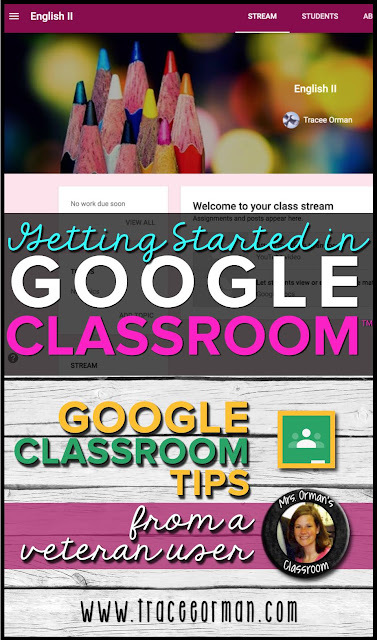 You will need to decide what is best for your classes. In the next post, I will show you how to add an announcement, assignment, poll your students, start a class discussion, and reuse a post from an archived or another class.